US envoy says the softening of relations between Israel and some Arab countries shows that the time is ripe for a diplomatic breakthrough. 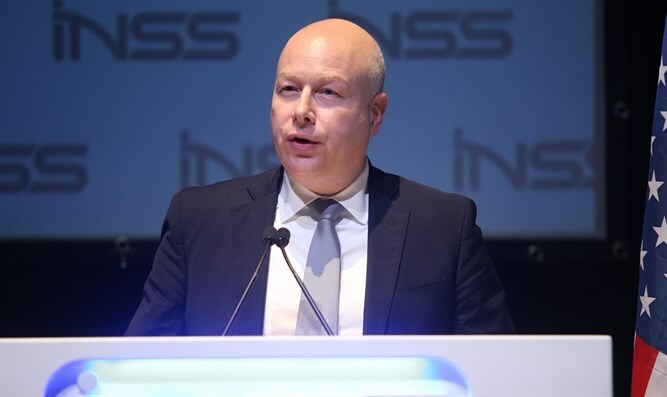 US special envoy for international negotiations Jason Greenblatt published an article this morning in Israel Hayom entitled "Now is the time to make peace and achieve prosperity in the Middle East." Greenblatt said that the hostility between the countries actually prevents Israel's neighbors from using Israeli innovation, as do many countries around the world, while noting the recent changes that have taken place with respect to the issue. Among other things, Greenblatt mentioned the statement by Oman's foreign minister that “Israel is a state that is present in this region. We all understand this, we know this; the world is also aware of this fact. But despite that, Israel is not being treated by the other countries as it is treating the other countries. Maybe it is time for Israel to be treated the same and it should also bear the same obligations as other countries. Why? Those are really facts." Greenblatt also noted the reports that Bahrain's King Hamad Bin Isa al-Khalifa recently allowed ministers and other officials in the kingdom to meet with senior Israeli officials, and the fact that the king also expressed his opposition to a boycott of Israel several times. "Officials from Arab countries are no longer afraid to be seen with Israeli officials. The ambassadors of the United Arab Emirates and Israel were not uncomfortable when they were seated around the same table in Washington. Egyptian President Al-Sisi recently praised Egypt's leadership as the first Arab country to establish diplomatic relations with Israel," Greenblatt wrote. In light of these things, Greenblatt stated at the end of the article, "It is time to work together for the stability and prosperity of the region. There are real threats and real challenges facing all the countries in the region. The Palestinians face the same threats and can also benefit from these efforts. Through cooperative efforts, Israel and its neighbors will finally be able to strive to realize the potential they deserve. Adhering to the old rules - the three ‘no's and the anti-normalization policies of the PLO and the Palestinian Authority - will hurt everyone: Israelis and Palestinians, as well as the region around them. Such old-fashioned approaches have proved ineffective and almost certainly harm everyone, and only make peace between Israelis and Palestinians more remote. The time has come for change, and it warms the heart to see that Arab leaders are showing the courage required to achieve it."